I have been doing several reviews lately on organic snacks and healthier eating choices. When I saw this cozy mystery I knew I needed to read it and share with my readers! Firstly I am loving these cozy mysteries, a genre that is light reading but keeps your attention. Perfect for a summer or laid back time to read. It kept me guessing until the end, now that is a great mystery! Dana, leaves the big city and opportunities in marketing to move home to Blossom Valley. A year has passed since her father's death and her mother is just not getting back into her groove. Dana wants to be there to help her mother and gives up city living to move back home. Mom helps secure a job for Dana at the new Spa that her friend is opening on her farm. A Spa with a sense of country living flare to it. Dana is working on promotions and ads for the O'Connell Organic Farm and Spa. Opening weekend, Dana finds herself pitching in with serving up dinner, catching escaped piglets, and even housekeeping for the guests. She discovers one of the guests is dead in his room! That isn't going to be good for business, especially when the police say he was stabbed. Full of characters this book has a little bit of everything in it. Zinnia the organic chef who creates the most unique (and lacking in flavor) foods around. Esther the hardworking owner at her wits end because of the murder. Queenie the honey bee lady who is half off her rocker. Fun characters in a small town setting. I really enjoyed this book. It kept me reading trying to figure out who dunnit.. I loved that it was set on a farm, yet had the spa feel to it. What a unique idea for a getaway to the country. The interaction between the characters was realistic and the conversation and dialogue in the book flowed wonderfully. 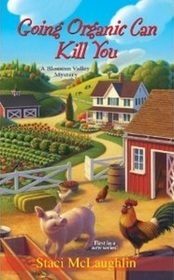 I am excited for book 2 to come out in the Blossom Valley Mystery series! I had never heard of this book and love mysteries! Thanks for sharing. I'll have to add it to my reading list. Looks like a fun read! Thanks for sharing! Sounds like a great read, I'll have to look for it!